I wanted to share some photographs we took during a very inspirational visit Flora Grubb Gardens in San Francisco, on our latest west coast design adventure. 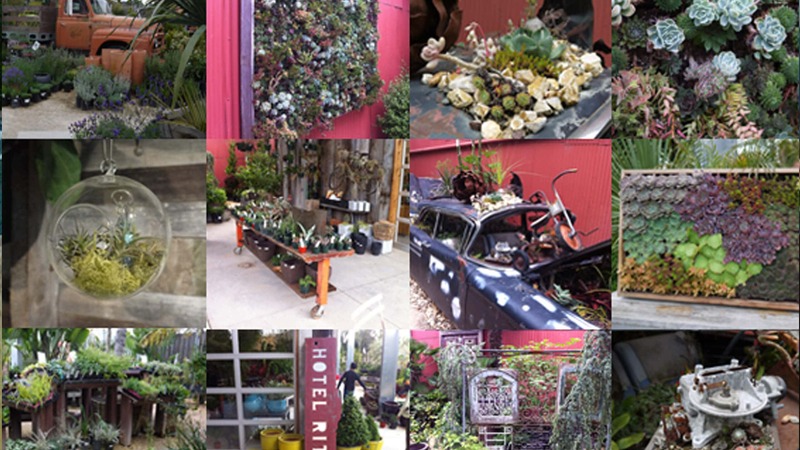 Flora’s use of found and made objects in combination with plants and landscape truly makes for visually amazing experience and has inspired me to start thinking about a bunch of new product lines – stay tuned for more on that. For those of you who have not heard of Flora Grubb she started growing plants at age 5. After 20 yrs of Texas gardening she moved west to SF where she started a landscape company in 2001. In 2003 she opened a small nursery in the mission district of SF, which soon became destination for local gardeners and landscape designers. In 2007 Flora and her partner Saul Nadler expanded to their new location in the Bayview District of San Francisco. The new location attracts people from around the world who want to experience Flora’s stunning array of succulent plants for dry landscapes. The new location also showcases durable, lush plants in concert with garden furnishings, books, and art, hosts garden- and art-related events, and welcomes visitors to linger over coffee at a branch of Ritual Coffee Roasters inside the store. If you are in the area I highly recommend a making time for a visit. Please click HERE to see our flickr feed.